Walt Coleman knows what it takes to lead through hostile environments. As a NFL referee with 26 years of experience, he has had to make decisions and lead with authority even when the coaches, team members and fans disagreed. 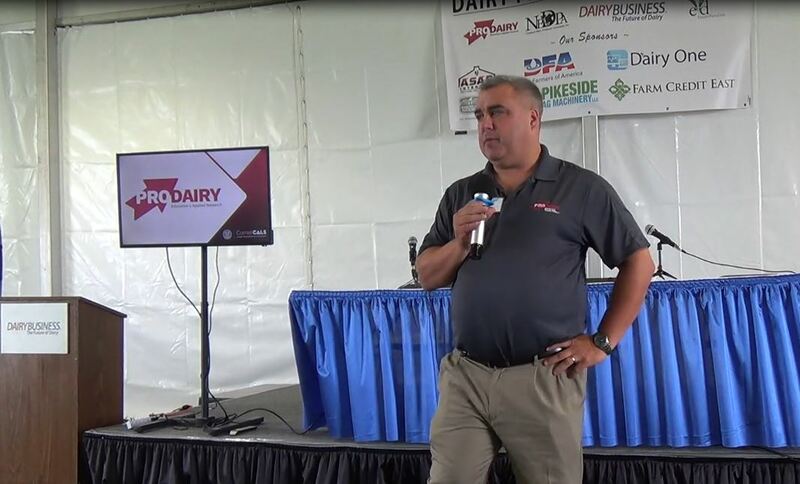 Coleman is also a family operator with Hiland Dairy in Little Rock, Arkansas, and will share his techniques for leading both on the football field and off with attendees at the 2018 Pennsylvania Dairy Summit. Coleman is one of five keynote speakers who will set the tone for this year’s Summit, which is considered the premier dairy educational event in Pennsylvania. The Summit is just around the corner, offering a mix of management training, industry insight, networking and inspiration appealing to anyone working in dairy. Hosted by the Professional Dairy Managers of Pennsylvania and the Center for Dairy Excellence, the Summit is now in its twelfth year and will be held on Wednesday and Thursday, February 21 – 22, at the Penn Stater Conference Center, just a few miles outside of the Penn State Main Campus in University Park, Pa. Succeeding in today’s challenging dairy environment can seem like an unsurmountable feat. However, Pennsylvania farm families are no strangers to investing ingenuity and pure grit to find the light through the clouds. This year’s Summit will provide the tools, insight and network to conquer that mountain ahead. This year’s theme for the Summit is “Climbing to New Heights,” with tracks focused on offering insight and training to challenge dairy producers, employees and industry professionals to continue toward new heights, despite working in a challenging and volatile dairy marketplace. Two keynote speakers will focus on business transition, offering insight on overcoming family dynamics and bringing in non-family partners to the operation. Ron Hanson, a Harlan Agribusiness Professor Emeritus, will speak on “Overcoming Family Challenges to Ensure a Smooth Farm Transition”. This will include the process of overcoming family challenges in relation to farm succession as well as planning for success within the next generation. As a retired University of Nebraska professor, Hanson has received university and national award recognitions, including the USDA Excellence in University Teaching Award. He has counseled with Nebraska farm families for over 40 years to help resolve family conflicts in a more positive manner and to improve family relations through better communication. 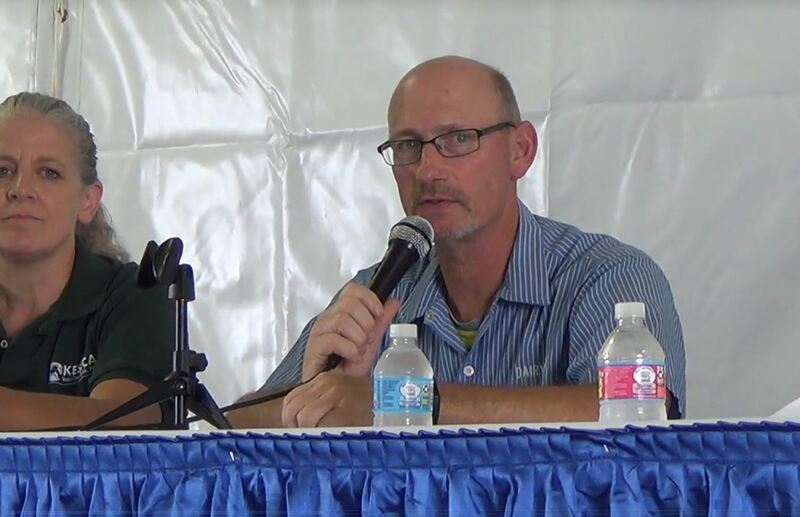 For those who do not have a next generation, Ron St. John, founder of Alliance Dairies in Trenton, FL, will share his insights and experience during “Bringing in Non-Family Partners”, which will focus on growing a dairy business by bringing in and transitioning to non-family partners and his tips for successfully turning it all over to the next generation. Originally a New Yorker, St. John relocated his family’s dairy to North Central Florida in 1986, and blazed a trail of innovation and expansion in dairy farming with Alliance Dairies; now the largest free-stall dairy in one location within the state with more than 5,000 mature cows and employing more than 120 people. Hanson will also lead a breakout session on developing a succession management plan as part of a breakout track focused on “Around the Table.” This track will offer insight on working through the softer issues influencing the dairy business, including managing stress and finding balance and keeping the farm within the family. 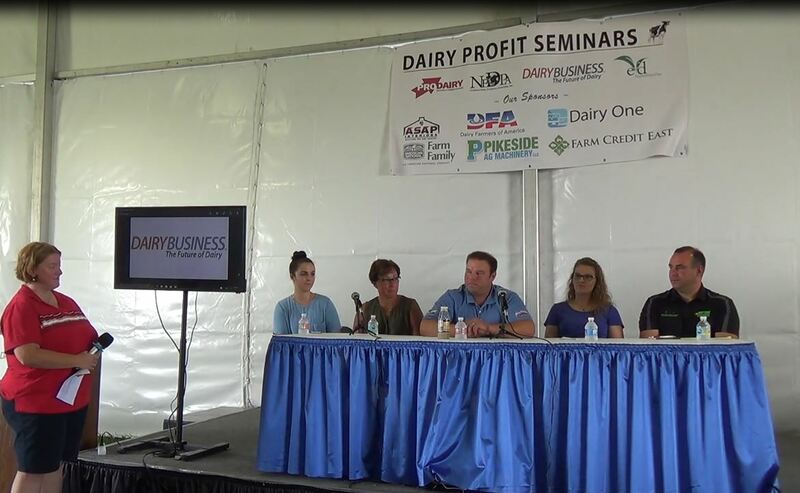 One farm’s transition team will lead a panel discussion on the timeline and best management practices they followed to transition their dairy to the next generation. Three other breakout tracks will also be part of this year’s Dairy Summit, focused on “At the Desk,” “With the Cows,” and “In the Field.” Details on the breakout tracks can be found on the Summit website at padairysummit.org. In addition to these tracks and the keynote speakers listed above, Nina Tiecholz, who authored “The Big Fat Surprise,” will be featured with her “Revealing the Big Fat Surprise” discussion. She will talk about her thoughts on the conventional wisdom about all fats with the groundbreaking claim that more, not less, dietary fat — including saturated fat — is what leads to better health, wellness, and fitness. Science shows that we have been needlessly avoiding meat, cheese, whole milk and eggs for decades and that we can, guilt-free, welcome these “whole fats” back into our lives. Finally, a major highlight of this year’s Summit will be the unveiling of the findings associated with the 2017 Pennsylvania Dairy Study. Dr. Andrew Novakovic, E.V. Baker professor of agricultural economics and director of land grant programs at the Cornell Dyson School of Business, is one of three economists commissioned by the Pennsylvania Department of Agriculture and the Center for Dairy Excellence to look at opportunities and inhibitors to growing the state’s dairy industry. 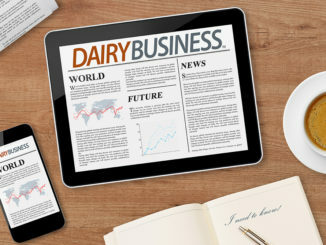 Novakovic will share a look at the Pennsylvania Dairy Study and what it has unveiled about Pennsylvania’s opportunities in growing its dairy industry. Dairy producers, employees and industry professionals interested in attending this year’s Dairy Summit are encouraged to register now for the two-day event. The two-day rate for this year’s Dairy Summit is $225 per person. Additional non-producers from the same organization can be registered at $175 per person for the two-day conference. The one-day rate for non-producers is $150 per person with additional registrations available at $125. Group rates are also available. Due to the economic situation facing dairy farms, the Center for Dairy Excellence has discounted registration fees for dairy producers and farm employees to $75 for the first registrant and $50 for each additional person from the same farm. One-day registration for dairy producers and farm employees is $25 per day. Room reservation fees are not included in the discounted rate. The Penn Stater Hotel and Conference Center has a block of discounted rooms available on a first come-first serve basis. Deadline for reserving at the Summit discounted rate is January 22, 2018. To learn more about the Pennsylvania Dairy Summit, call the Summit Business Office at 814-355-2467 or visit padairysummit.org. 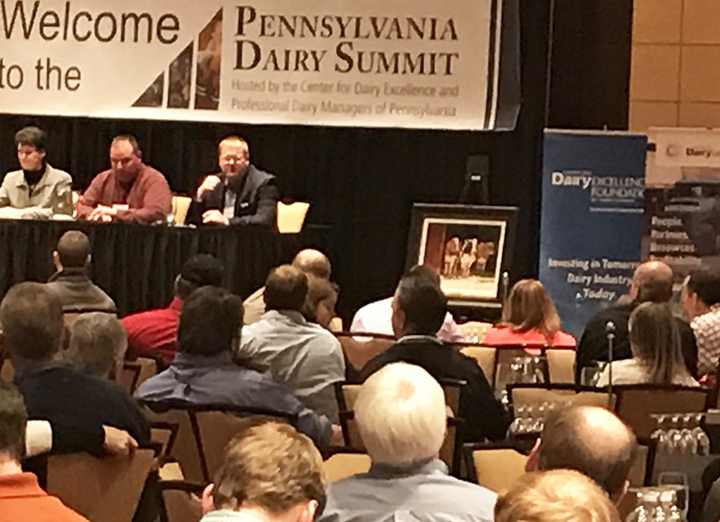 Breakout sessions that are part of the 2018 Pennsylvania Dairy Summit focus on four main tracks. Attendees can follow their preferred track or mix and match to attend the sessions they want. “Balancing Your Life: Farm, Self and Family” with Myra Handy of Farm First. This session will discuss how to cope with stress, identifying symptoms and signs of stress, and resources to help those with depression and stress. “Keeping the Farm in the Family” a transition panel discussion. This session will discuss the timeline associated with the planning process, transition teams, when to start planning, who to involve and why, key learnings in the transition process and key outcomes or goals. “Developing a Succession Management Plan” with Dr. Ron Hanson, Harlan Agribusiness Professor Emeritus. This session will discuss the pitfalls that come without proper planning, navigating the planning process, and best management practices. “Constructing an Informed Financial Plan” with Tom Anderson of Riverland Community College. This session will discuss financial models that lead to sound business decisions, how to record and analyze those records, and how financial models can benefit in volatile markets. “Maintaining/Growing a Productive and Satisfied Work Force” with Dr. Rich Stop. This session will discuss pay strategies, SOPs for employee management, performance evaluations, interviewing, training employees and leadership. “Shaping a Path Forward for Pennsylvania’s Dairyland” with Dr. Andy Novakovic, E.V. 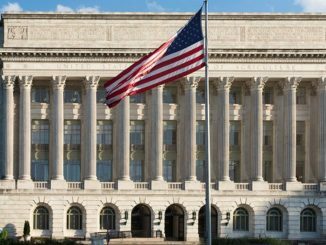 Baker professor of agricultural economics and director of land grant programs at the Cornell Dyson School of Business. This session will include a look at the Pennsylvania Dairy Study and what it has unveiled about Pennsylvania’s opportunities and challenges in growing its dairy industry. “Transitioning to Peak Performance” with Jim Osborne of Millerstown Veterinary Associates, and Myron Gehman of Kurtz Valley Holsteins. This session will discuss protocols associated with calving that east the transition period, higher peak performance, and milk production during lactation. “Deciding if Robotics Is Right for You” with Dr. Tom Anderson of Riverdale Community College. This session will discuss the advantages and disadvantages of robotic milking systems, including planning your robotics operation. “Monitoring Reproductive Performance and Profitability” with Dr. James Ferguson of University of Pennsylvania New Bolton Center. This session will discuss SOPs for maximizing reproductive performance with a focus on profitable solutions that yield positive results. “Evaluating Corn Silage Management” with Dr. Jessica Williamson of the Pennsylvania State University. This session will discuss corn silage trial research to provide ideas of best management practices that producers can implement in their corn silage selection and management process. “Innovating Your Manure Management System” with Steve Rowe of Newtrient Solutions. This session will discuss technology and innovations available to maximize nutrient recovery and products available to make manure a valuable resource. “Integrating Low Lignin Alfalfa into Your Forage Strategy” with Dr. Dan Undersander of the University of Wisconsin. This session will discuss the benefits and challenges of low lignin alfalfa and how to incorporate this alfalfa into forage strategies. Learn more about the 2018 Pennsylvania Dairy Summit at padairysummit.org.